"As far as I can remember, I’ve always written and told myself stories, but it took the death of a very dear friend to convince me that it was futile to hold down a job I hated instead of doing something I’d always yearned to do: write full-time. Once I had taken that decision, I took a few creative writing classes at our local community college but it was an online writing course that opened the doors for me and convinced me I could do this. In 1995 I joined Writelab, run by a wonderful writer named J. R. Lankford. It was a structured writing course with constructive critique from other would-be writers enrolled in the course. There, I met two wonderful people who eventually became part of my critique group and who still support me and occasionally (virtually) hit me over the head when I’m not meeting my potential. It was also at Writelab that Jack Meter was born. I used him for exercises on point-of-view, dialogue, characterization, flashback, internal dialogue, etc. When I was finished with the course, I thought I was finished with Jack. I was wrong. Like a best friend who had moved to a distant city, I missed him. I realized that during the time I had used him as an anchor for my writing exercises he had become important to me. After several months of resistance, I put together the bits and pieces I had written during Writelab and fleshed out the story. Originally entitled ‘Til the Fat Lady Sings, it was published as an ebook in 2000. When the publisher folded, I sold it again to my current publisher, Zumaya Publications and the title changed to Metered Space. Metered Space was supposed to stand alone. I went on to write two other novels (Catalyst, tentative pub date 2010), and Synergy, published in 2007. But Jack had other ideas. He kept insisting that his story wasn’t over yet, that we had a lot more road to walk together. From his insistence were born Meter Made (2005) and the Jack Meter Case Files series. Meter Destiny (2008), the novel showcased here, is the third one in the series, although it can be read as a standalone book. Two more Case Files are under the editing block. If I talk about Jack as if he were a real person, it’s because he is real to me. When a writer lives with a character for years (albeit only in his or her head), developing a sense of intimacy is inevitable. And no, Jack is not me, nor is he the me I’d like to be. He’s simply Jack Meter, someone who lives a pretty bizarre life and who struggles with who he is. Destiny. Friendship. Family. Jack Meter hasn’t spent a lot of time on these ideas and has avoided them completely since Annie’s violent death three years before. But the claim of a strange group calling themselves the Fates from Mythology that it is still controlling Life on Earth and the Fates’ allegation that one of them was kidnapped, force him to review where these concepts fit in his life. As Jack Meter unravels the kidnapping mystery by wading through a series of riddles and lies, and as he realizes his new clients are using him and his friends in a game of their own, he finally understands he must accept his own destiny. But will that understanding come in time to save his friends’ lives and stop a sociopathic alien from destroying everything Jack knows and believes in?" 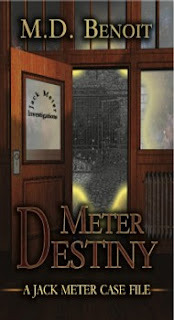 Meter Destiny is available online both as a trade paperback (e.g., amazon, Barnes and Noble) and as an ebook (e.g., amazon, eReader, Fictionwise, Mobipocket). During Read an eBook Week, March 8-14, M. D. will give away the first two ebook versions of the Jack Meter Case Files in the series if you buy the third. Check out details during that week on her website (http://mdbenoit.com) and her blog (http://mdbenoit.com/blog).